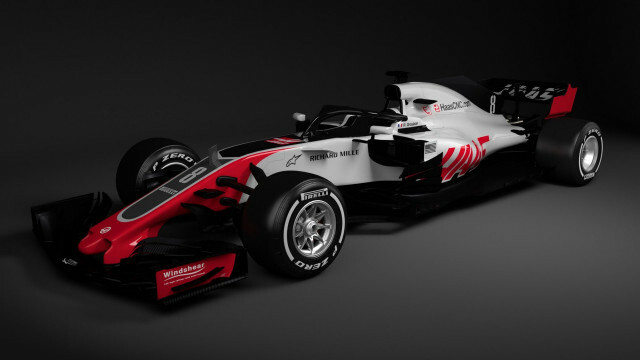 The Haas Formula One team is first on the grid to reveal images of its 2018 F1 car. It sets a standard of what we can expect from other teams with the mandatory requirement for a driver “halo” this season. The shark fin over the engine cover is gone per new regulations, but the big news is the wishbone-shaped driver halo, which provides protection for the driver and is rather hard to see because it’s painted black and is shot against a dark background. It provides an aerodynamic disadvantage and adds weight, but all teams will face similar dilemmas. “It took quite a bit of study by the aerodynamicists, but the designers had to work hard to modify the chassis so the halo could survive the mandated loads. The total minimum weight of the car increased because of the halo, and there’s a higher center of gravity simply because of the halo’s position,” Guenther Steiner, team principal for Haas Racing, said. We have to admit, the halo doesn’t look nearly as bad as it could. The rest of the car sports a black, gray, and red livery full of subtle nods to Haas Automation machinery. Steiner said the look is clean and precise. Haas is a newcomer to the motorsport and placed eighth overall in 2017 during its sophomore outing. Haas Racing hopes its same ethos at Haas Automation of “details and constant refinement” will continue to develop a world-class racing program.